Hacker or makerspaces are the latest in a long tradition of community spaces that offer opportunities for informal learning. On a dark winter’s night in Melbourne’s Hawthorn, a lime green perspex door trimmed with LED lights up a cobbled laneway. The Connected Community HackerSpace (CCHS) in the converted garage welcomes people who want to work on DIY technology or artistic projects. Over 50 members have access to space, tools, technology and to a community of like-minded enthusiasts. Inside a handful of members are working together and individually on a range of DIY projects. At one table, Tim is building a device that uses sensors and internet connectivity to send information. If an elderly or frail person carrying the device in their pocket has a fall, it can send a message via email or social media to alert health professionals or family. At the lathe, Andrew is enjoying learning more traditional machine shop skills that he missed out on at school to make a scribe that can etch plastic, a far better alternative than a permanent marker. Learning by making is a hands-on process. First there’s the process of experimenting, seeing what works and what doesn’t, adapting your approach and trying again. Hackerspaces, sometimes called makerspaces or fablabs, are places where people gather to invent, create and learn through creative DIY. Hackerspaces emerged in the early 1990s and today there are over 1200 worldwide, with around 20 in Australia. ‘Our goal is to empower people to experiment and figure out the way to make the project work within the budget they’ve got and the tools available,’ Andy says. The range of tools and machinery available is growing all the time and includes 3D printers, specialist electronics equipment, laser cutters, CNC mills, power tools and lathes. An ongoing challenge is overcoming the negative connotations of the word ‘hackerspace’. Andy says it’s disappointing that the word ‘hacking’ is so misunderstood. Many people think of hackers as cyber criminals breaking into computer systems, stealing online passwords and breaking into bank accounts. In fact the term also refers to creative people who adapt and alter existing technology to solve unique problems or adapt a piece of equipment to use it in a new way. One group project team that included Andy Gelme invented LIFX, the first WiFi-enabled LED lightbulb controlled via smartphone. After a successful Kickstarter campaign the concept has since been sold to a US company. Andy Gelme demonstrating the LIFX lightbulb. Whether they are working on an individual or a group project, each member is there to learn as well as teach. Then there’s sharing what you know with others, and in group projects, collaborating and communicating to solving problems. 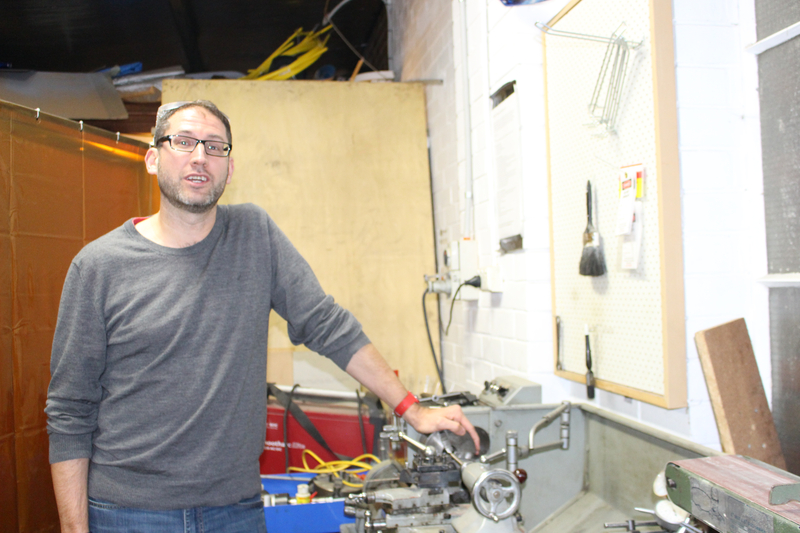 Open days and workshops are one way the CCHS promotes itself and recruits new enthusiasts. On family days, NodeBots and Minecraft hacks are popular. 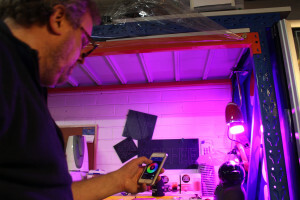 Hackerspaces have become popular since the internet has made the technology and knowledge for DIY projects more available than it’s ever been. At the same time, especially in cities, the lack of space means fewer people have the room to set up a home workshop. You just have to look around to see that the building itself has been hacked. Members have adapted and shaped it for their needs, from designing and installing the fluorescent plexiglass door to let in light and air to the shelving, benches, 3D printers and security system. A member-built card reader attached to the milling machine only allows the machine to be turned on and operated by members who’ve completed the required safety training. 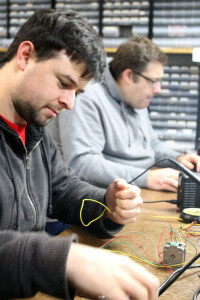 More information about Connected Community Hackerspace (CCHS) is available on their website.